I’m Ed Smith, a Sacramento Motorcycle Accident Attorney. The California Highway Patrol (CHP) indicated that two motorcycles had been speeding moments before a fatal crash. A motorcyclist was fatally injured in a crash on Friday, February 12, 2016. His motorcycle rear-ended a car on the connector of westbound Highway 50 and northbound Capital City Freeway. The accident happened about 5:00 p.m. Officials indicated that two motorcyclists had been weaving in and out of traffic at unsafe speeds. One of the motorcyclists rear ended a Kia Rio. The impact caused the motorcyclist to receive fatal injuries. Investigators are trying to determine if the motorcycles were racing at the time of the crash. The other motorcyclist did not collide with any vehicles. Were there Injuries to occupants in the Kia Rio? No injuries were reported inside the Kia Rio vehicle that was rear ended by the motorcyclist. The connector had to be shut down while officials investigated the accident scene. I’m Ed Smith, a Sacramento Motorcycle Accident Lawyer. I’ve been serving seriously injured motorcyclists since 1982. I’ve built a comprehensive accident and injury website, AutoAccident.com. 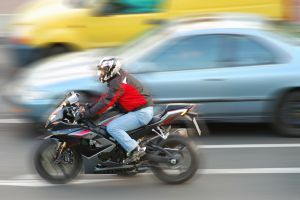 There are so many unique legal aspects that must be considered in determining fault in motorcycle accident cases. This is why you need an experienced motorcycle accident lawyer working on your behalf. If you, or a family member, has been seriously injured or killed in a motorcycle accident, please call me at (916) 921-6400 for free, friendly advice. You can call me toll free at (800) 404-5400 if you are outside the Sacramento region. Be sure to look at my client reviews on: Yelp and Avvo and Google. I’m a distinguished member of Million Dollar Advocates Forum. View my track record of success: Past verdicts and settlements. Photo Attribution: Wikimedia Commons (in the public domain images – lanesplitting.jpg).